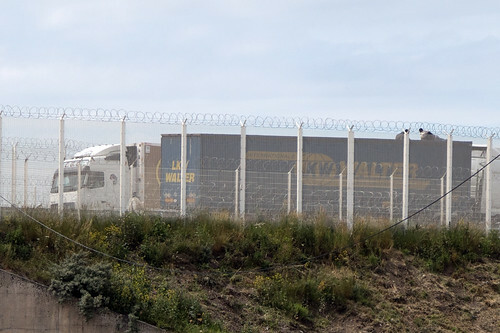 While the British were voting to leave the European Union I was across the Channel in the refugee camp known as the “Jungle.” Located in Calais, France, the informal camp is the last stop for immigrants hoping to enter England undetected via the Channel Tunnel. 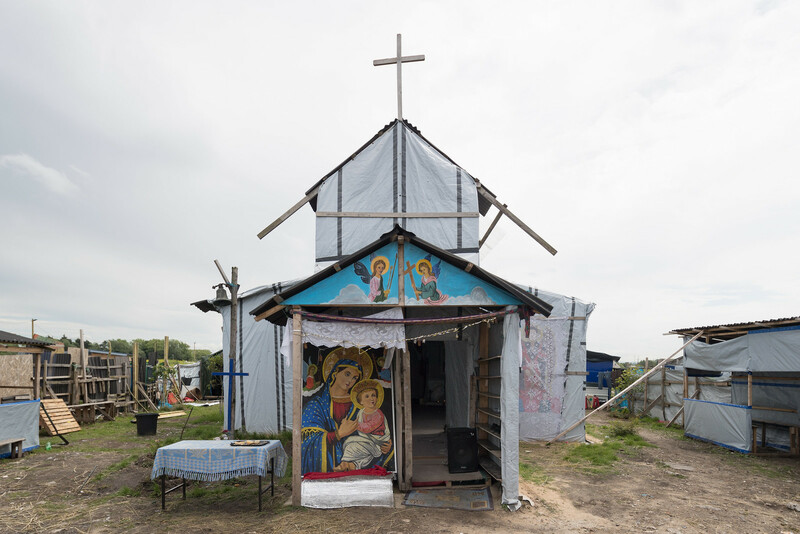 The camp and its 6,000+ residents have become a symbol of for Britain’s changing relationship with Europe and its former colonies, not to mention the demographic changes and refugee crises that seem to be so important for those who support Britain leaving the E.U. During the time the “Jungle’s” representation has been central to such political conflicts, the camp itself has taken a number of forms. 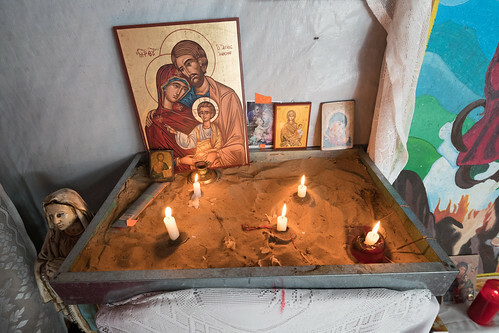 It continues to increase in size, but its most dramatic changes have been relatively recent, particularly the demolition of a 100-meter wide section of the camp that abutted an elevated highway and the construction of a new formal aid center inside the informal camp. 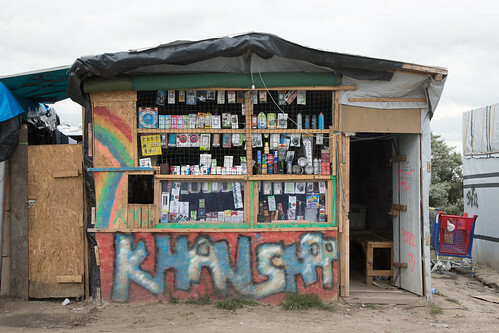 Other changes include the establishment of a nearby site that offers additional security for women and children apart from the male dominated main camp. One short note before I continue to the main text: I include photographs in the post, but I only photographed for a small portion of the time I was at the camp. When I did photograph, I always asked for permission first and intentionally avoided close-up photographs in most cases. Additionally, I’ve only included the names of a couple of residents and volunteers who are publicly known. This is to protect the privacy of the refugees, many of whom are understandably concerned about broadcasting their temporary association with the camp, particularly given their desire to enter England as undocumented immigrants. This also goes for volunteers, who have their own concerns about attacks from nationalist groups and persecution (and prosecution) by the police for their activities, which are not always appreciated by authorities. 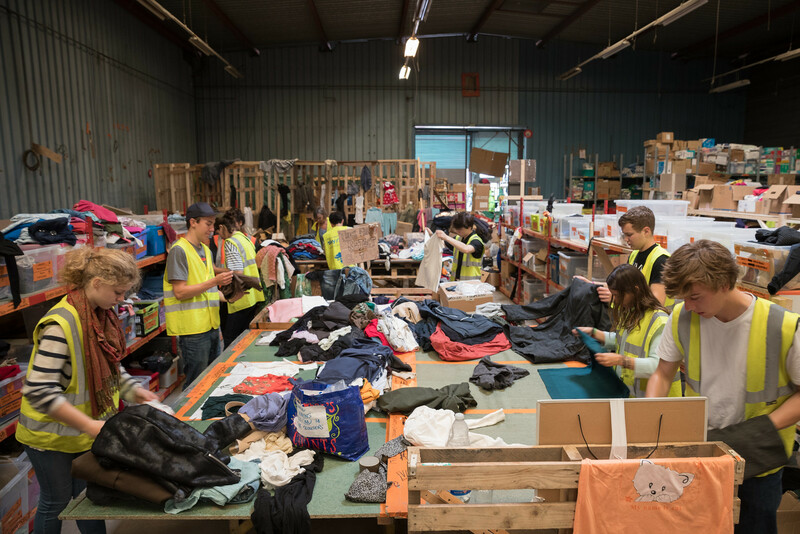 I was able to visit the camp with the refugee relief organization L’Auberge des Migrants, which distributes clothing and other essentials to residents. 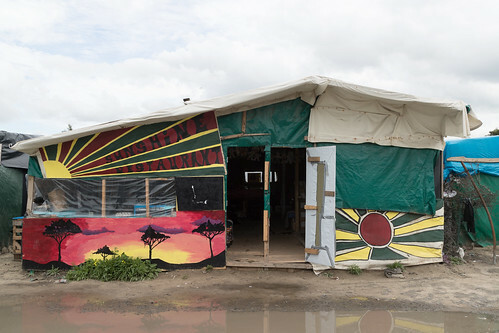 The organization coordinates its activities in a warehouse that is a short drive from the camp. Their grounds house a donation sorting center, the food relief organization Refugee Community Kitchen, and “Caravanarnia,” a camp for volunteers who wish to stay at the warehouse. L’Auberge des Migrants volunteers sorting clothing. 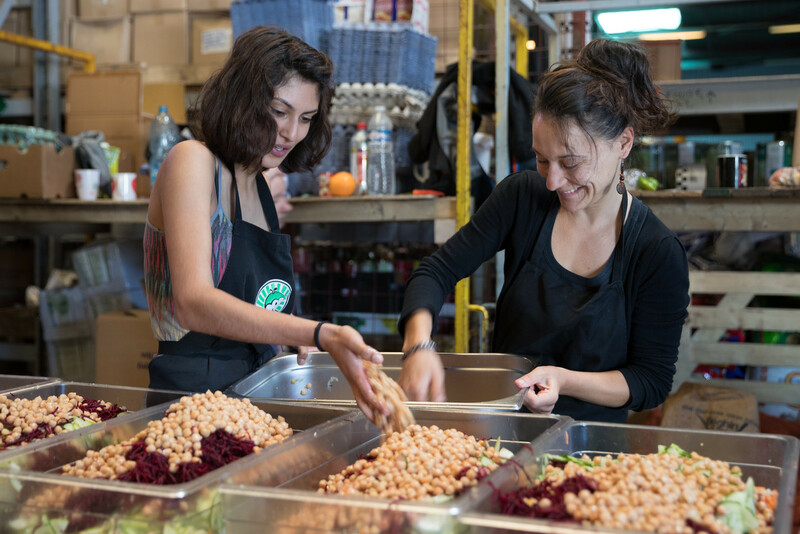 Refugee Community Kitchen volunteers preparing the day’s salad. My visit to the “Jungle” started with an introduction from Maya Konforti, one of the leaders of the organization. Konforti has been working in the camp since its infancy, and walking through its streets yields a near constant stream of greetings, hugs, and calls of “Mama!” as she passes. 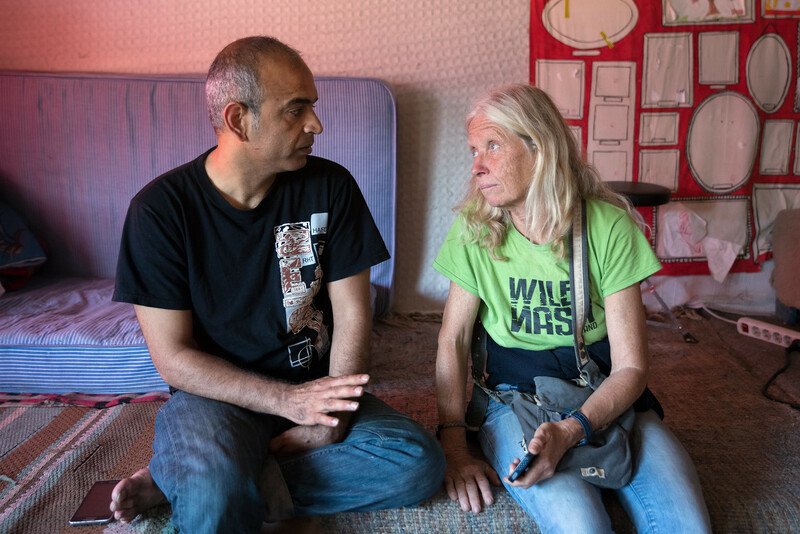 Among those Konforti and I visited was an Afghan immigrant named Sikander, who founded Jungle Books Kids’ Restaurant with his English partner Mary Jones. 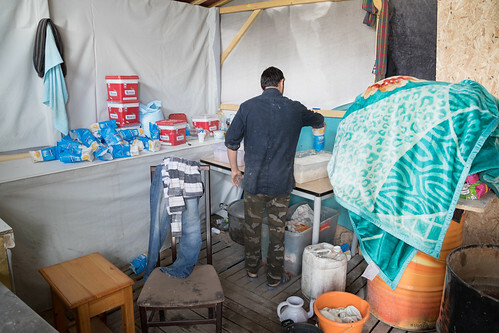 Sikander gradually created the first restaurant in the camp while selling food to people who stayed with him. 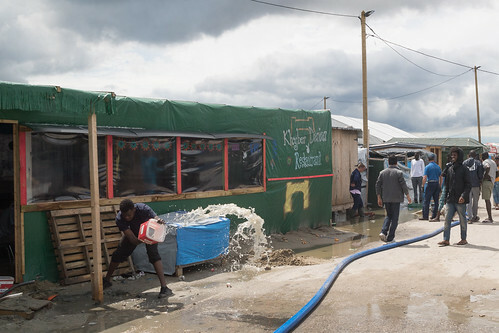 After running a couple of small restaurants in the first portion of the Jungle that was demolished by authorities, the pair was distressed by the conditions endured by the camp’s 700 minors, of which nearly 80% are unaccompanied in Calais. 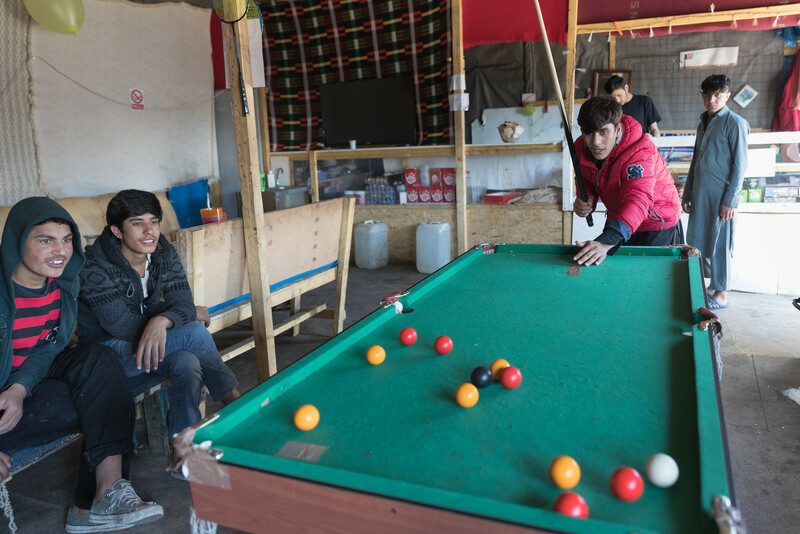 In response, they created a place where the camp’s young residents can hang out, eat, learn, and keep out of trouble in a camp teeming with drugs and other threats. Teenagers playing billiards at Jungle Books. Sikander and Maya Konforti talking in the center. 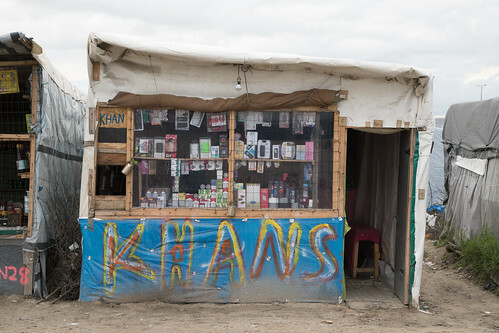 After Konforti and I parted for the afternoon, I wandered the camp, meeting refugees from Afghanistan, Eritrea, Ethiopia, Pakistan, Somalia, and Sudan, and spending time in restaurants, shops, and the occasional home. When people learned I was American, they always asked about American politics, particularly about Donald Trump’s candidacy and his public support. Invariably, conversation drifted to immigration policy in the U.S. and then to the Brexit. What would it all mean for the refugees? 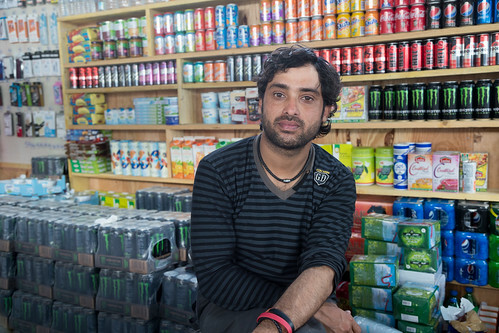 The friend of a shop owner watches his store, and a baker prepares naan. A few of the restaurants and shops on the main street. 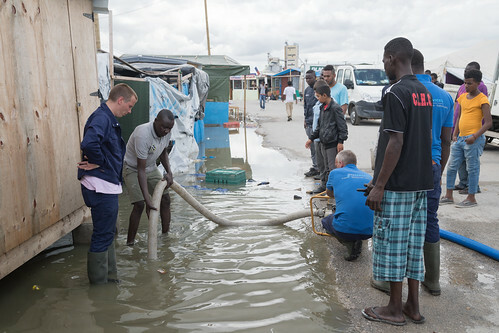 It stormed the night before, so there was standing water everywhere, and people were drying out the belongings of their tents. Many streets and paths were flooded; some were being cleared. Since I’d read about the large Ethiopian church spared from demolition a few months earlier, I decided to leave the main camp area and walk down the pathway to the church. I waited until the residents in the church were done praying, then took off my shoes and entered the church. Within a few minutes of being inside, I heard the dull sound of projectiles firing in the distance and then bustling around the church. 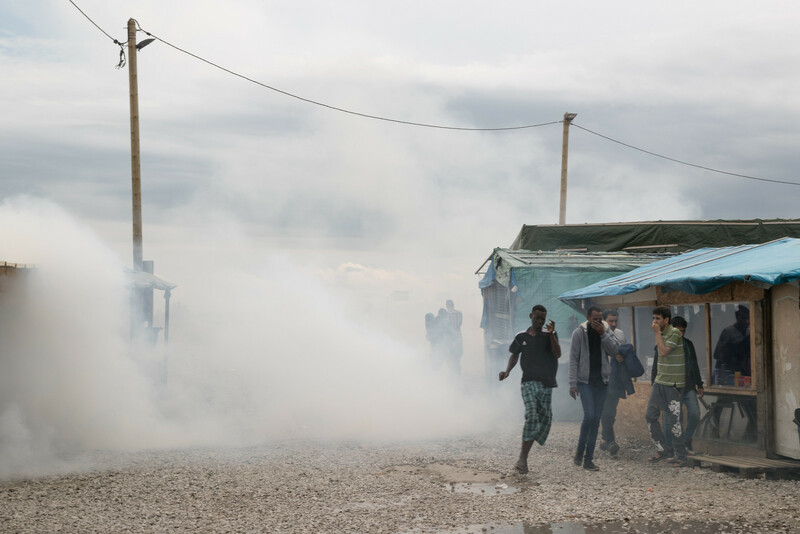 I put on my shoes and walked out of the church courtyard to see tear gas lingering by the entrance to the camp and residents fleeing the area. One of the Pakistani residents with whom I’d recently spoken pointed out the problem areas. Minutes before, a number of refugees tried to climb on top of stopped semi-trailer trucks on the highway in hopes of riding them into the trains that traverse the tunnel. 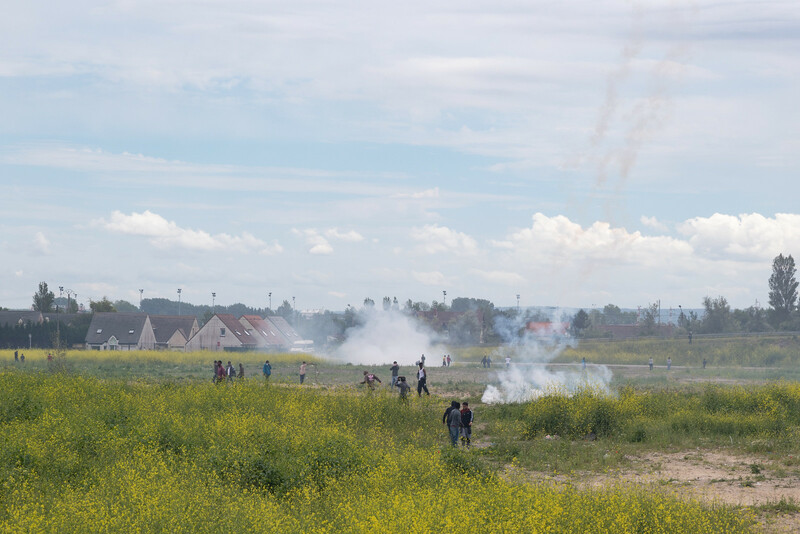 The police fired tear gas in an attempt to get the refugees off the highway and then keep them out of the 100 meter zone. While some residents retreated, the commotion enlarged the crowd, which was in the hundreds by the time I made it down to the area. Residents on top of a semi-trailer truck and fleeing the tear gas on the highway. 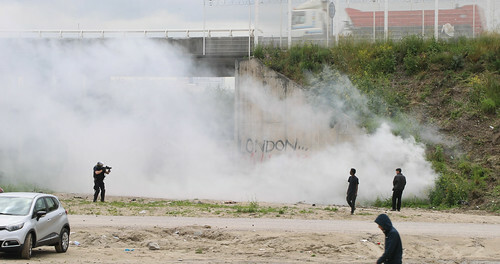 The police firing tear gas into the 100 meter exclusion zone. Camp residents standing on the embankment overlooking the highway and exclusion zone. After standing on the embankment for a few minutes watching the tear gas get launched elsewhere and the police corralling some demonstrators, one young resident in his late teens picked up a rock from the area behind the ridge on which most residents were standing. A few people looked back at him and urged him “No, no, no!” After pausing for a few moments, he hurled the rock over the crowd. The rock didn’t land near the police but they quickly turned, directed their tear gas at the ridge and fired their canisters. 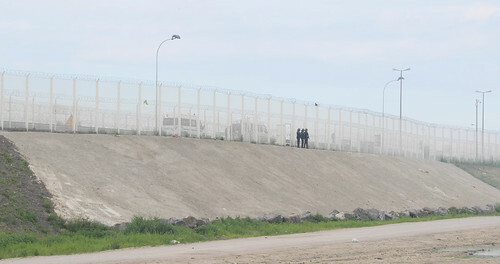 Police guarding the highway and threatening refugees getting too close to the tear gas canisters. Everyone on the mound scrambled down to the walls of the small buildings that define the edge of the camp, seeking a way to squeeze between structures and make their way deeper into the camp. I found a way through a couple of makeshift buildings and ended up on the main street. The gas tumbled through the main entrance and down the thoroughfare. Two young men and I rushed back into their rooms adjacent to an Eritrean restaurant and paused. The room had a dirt floor, rolled up blankets for sleeping, and some personal effects. We caught our breath. But the gas seeped in through the semi-open walls and then hung in the room. We headed out between the rear of the building and the scrub, where the wind would at least eventually clear out the air. We waited it out. Once the tear gas thinned, I left the area behind the houses and walked across the street to Jungle Books Kids’ Restaurant. The blinds had been drawn, and the young residents were sitting around and talking. Some were eating, others washing out their eyes. A volunteer was waiting to start an English lesson at 4pm. After another 20 minutes, the wind had blown the tear gas to the south. Residents had already begun to return to daily life in the camp, re-opening blinds, then stores, then returning to the streets. 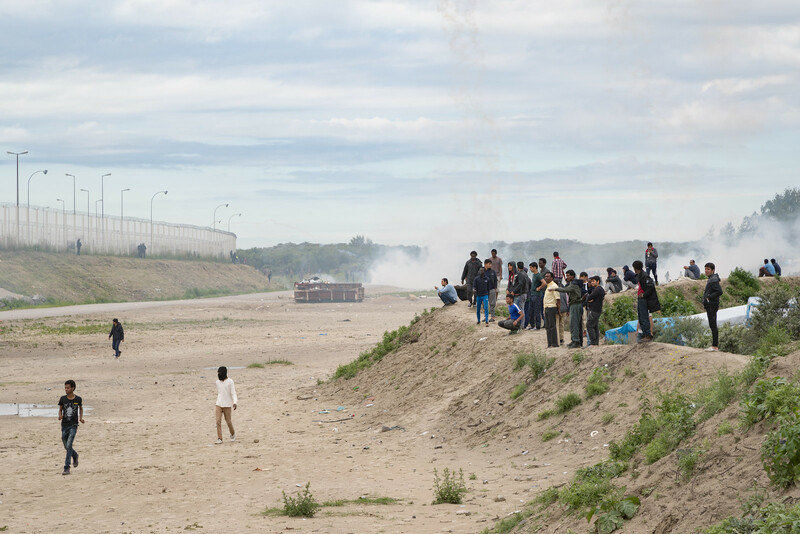 Even as the situation calmed, the police presence maintained a tense posture along the border of the camp, standing with their weapons drawn and scanning the “Jungle.” The last major tear gassing had been three days before. Residents were already thinking about another attempt to get to Britain. 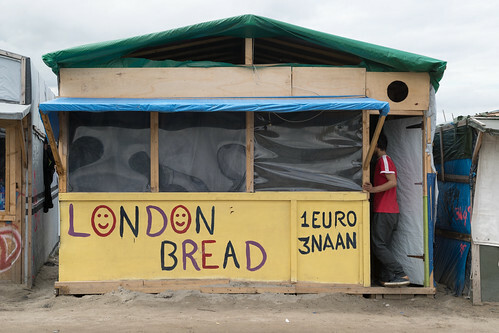 In a way, it was a normal day in the camp, but the Brexit vote has created a new layer of complications. 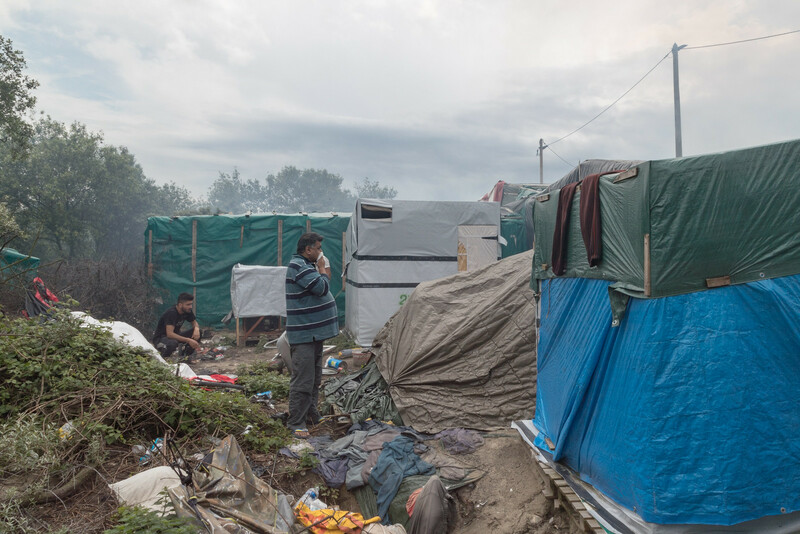 The treaty and practices that facilitated the creation of the camp are relatively unpopular in France, and politicians, including the mayor of Calais, are already intensifying calls for changing how France and the U.K. police the Channel and its transportation links. Any alterations will surely affect the refugees and their likelihood of reaching a new home in Britain — or anywhere else. 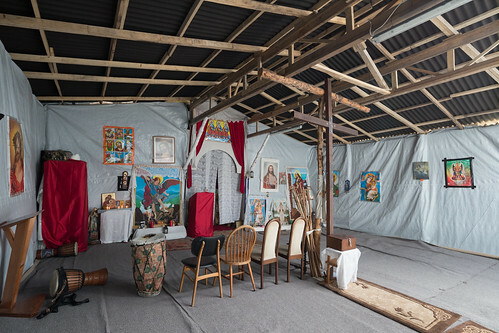 This piece is an extension of a residency organized by the Centre Régional de la Photographie Nord — Pas-de-Calais and the Hyde Park Art Center and funded by the MacArthur Foundation. THIS IS AMAZING WORK ~ BRAVO !